His “Mert Arm” is the key to going fast, Jake says. It’s changed his life. Forever. The “Mert Arm” is a prosthetic hand, designed and manufactured by 1969 AMA Grand National Champion Mert Lawwill. When one end is attached to the handlebar of his Honda CRF 150 and the other end to Jake, it transforms him into a 13-year-old Scott Summers. When attached to the handlebar of his mountain bike, it allows him to ride every day after school. Just like every other kid. You see, Jake was born without a right hand, but the birth defect hasn’t slowed him much – especially since he discovered the Lawwill-made prosthetic a year ago. “I’ve learned to adapt,” he says without hesitation, ready to move on to more exciting subjects, like riding that little Honda through mud. “Rain or snow, I’m racing again on November 15,” Jake enthuses. “It’s the Egg Hunt. You pick up eggs, they used to have just one colorbutnowtheyhavetwobecause… .” He’s off and running now, his words running together. To slow him, your have to interrupt, ask another question. Jake is a member of the Variety Riders Motorcycle Club in Illinois. 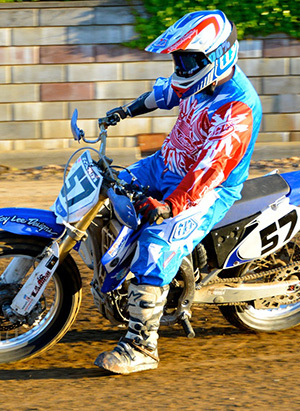 He races with the club, taking part in mostly woods races, though he used to race motocross when he was younger. Back then, he used a “pincher claw” on his right hand. That was pre-Mert Arm. It was the equivalent of drum brakes when compared to discs, dual shocks to monoshock. This Mert Arm… well, it’s trick. No two ways about it. And is has transformed him as a rider. Sounds easy enough. Okay, now try it with one hand. Since Jake’s birth defect left him without a right hand, everything on his motorcycle has been moved to the other side. Front brake, throttle, clutch… it’s all controlled by the left hand. Think about it. Clutch, throttle, front brake. All with one hand. It’s enough to make Chinese arithmetic seem easy. It’s so complicated I was having trouble understanding as Jake patiently tried to explain it to me. And I’m pretty sure I still don’t have it right. As far as I can tell, Jake uses his thumb for the clutch and his middle finger for the brake, with the brake lever mounted backwards. Again, the kid was talking about his motorcycle. So he was excited. And talking fast. Really fast. “Learn to use the front brake… that was the most difficult part,” Jake said. I figured out another way to slow Jake down early in the conversation. I brought up school. He says he’s a good student, but that pesky math. “Well, math… You know, it’s just alright.” Kids. Back to the bike. Is this kid a racer or what? Fall down. Blames the tires. When he does fall down, Lawwill’s invention allows the arm to quick releases from the handlebar, making Jake’s crashes no different than ours. Jake races about four times in the spring, takes the summer off, does a few hill climbs along the way and dreams of getting to race flat track. He’s fortunate in that he can ride just six miles from his home in Ottawa, Illinois. He’s got me so pumped from talking to him that I’m ready to send him money for a steel shoe. In addition to riding his motorcycle and new mountain bike (he controls the rear gears with a twist-grip shifter, the front gears with a thumb-shifter), Jake also dabbles with wrestling and track and field at school. But it all points back to motorcycling. Somehow you get the feeling that he’ll be there. This isn’t a kid who gives up real easily. Then came the Suzuki JR80 (and, finally, the Mert Arm). And now the CRF150. If he sits still long enough, you can find Jake watching NASCAR on TV. He’s a huge fan, his loyalties sitting squarely in Mark Martin’s lap – but not just because he has a cousin of the same name. But back to the Mert Arm for a minute… Just how does one stumble across the one thing that’s destined to change his life forever? 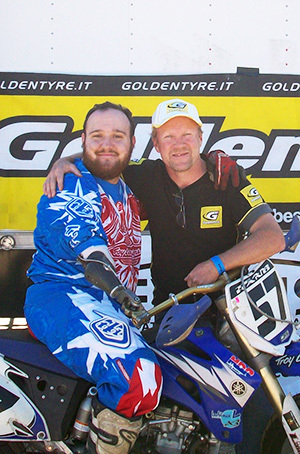 Draayer was killed this year in a street-bike accident, but not before a highly successful racing career – with both his real arm and his Mert Arm. Jake speaks highly of him. Now Jake and Draayer are forever linked. The McCulloughs hold Lawwill in high regard, as many parents would of a person who made such a dramatically positive change in their child’s life. “Jake is ecstatic with anything that has to do with Mert Lawwill,” Jack McCullough said. “It’s unbelievable what he’s done for Jake. Motorcycle people don’t just help motorcycle people – guys like Mert help everybody. I really can’t say enough about him.” Says Jake. All too many kids with physical challenges such as Jake’s tend to withdraw from society. They hide their prosthesis; they shy from venturing out in public… not so for Jake. In fact, it’s quite the opposite. Jake is out there trying to make a difference. He’s there to try and help those other kids. In fact, he’s gone on the road as a motivational speaker for a group called Creative Mobilities, an organization dedicated to getting the physically challenged on bicycles. The group is run through The Bike Rack in nearby St. Charles. That’s where Jake gets his bicycles. It’s where he stays involved –doing what he can to help. After conversing with Jake enough to interrupt his homework, you hang up knowing that you’ve just spent time with a solid, well-rounded kid. You also know for certain that the Mert Arm doesn’t do a lot of dust collecting around the McCullough house.